Ultra Dairy Digest, 60 Vegetarian Capsules (Nature's Wonderland) - Penn Herb Co. Ltd.
Lactose, proteins and fats are contributors to dairy food intolerances. 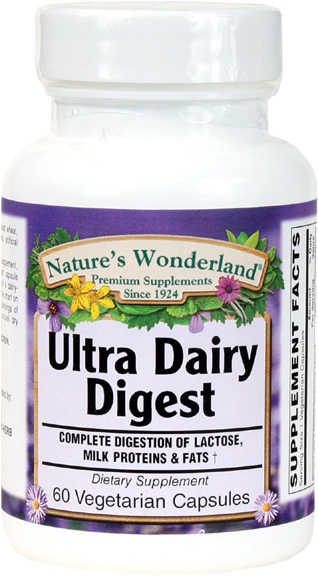 Ultra Dairy Digest contains the important enzymes needed to completely break down all three categories of nutrients. Simple take 1 vegetarian capsule immediately for each serving of a dairy containing food.